This model of liner is know from the XI century a.d. Cotton liner is worn under Norman, Phrygian or Conical Helmet, Kettle Hat, Morion and Sallets type helmets. 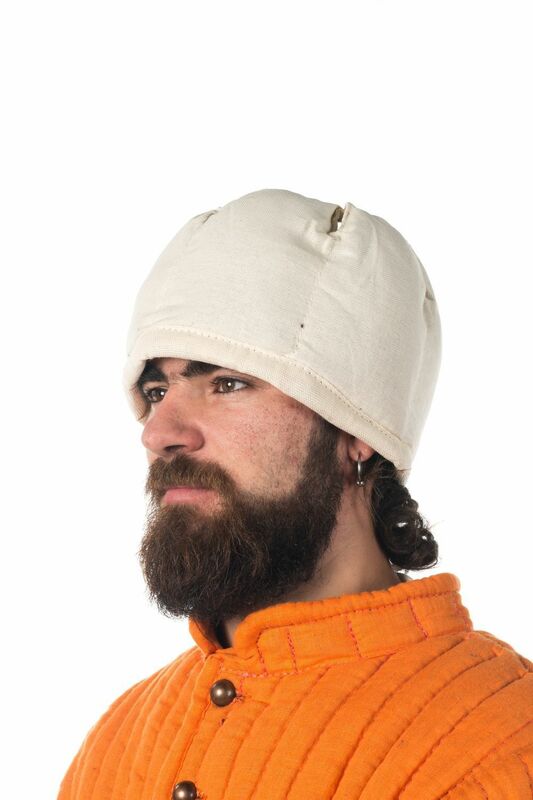 It has drawstring on its top to adjust fitting up to your head size. The liner provides with a good protection during medieval battles or trainigs. This type of liner requires the installation into the helmet with rivets or by sewing. It's unappropriated for usage without fixing to helmet. The liner is stuffed with sheet wadding (natural material) and can be made of cotton or linen in any colour. This liner is good to be worn under the Bascinet, Great Bascinet, Barbute or "Sugar Loaf" helmet. It requires the installation into the helmet with rivets or by sewing. Simple, but historically corrected design of the liner provides with perfect protection during medieval battles, tournaments or trainings. The liner is made of 100% natural fabric - cotton or linen, by your regard, and is stuffed with sheet wadding (natural material). .. This Liner set provides comfort helmet wearing and complete protection of your head, neck, and shoulders. This Great Helm cotton liner is a full set of 4 pieces, that are stuffed with sheet wadding (natural material) - padded pelerine with front leather fastenings - padded cap - padded ring - round padded insert It may be worn as separate pieces - pelerine and cap - as well as a full set. Liner is also could be worn under the Chapel, Morion, Norman, Phrygian types of medieval helmet, Great Helm and "Sugar loaf". Simple design of liner provides with comfortable putting helmet on the head and a perfect protection during medieval battles, tournaments or trainings. .. It is known since Early Middle Ages. Liner is very firm and enduring. It requires the installation into the helmet. Leather liner is worn under Norman, Spangen or Conic Helmet, Kettle Hat and Sallets type helmets. 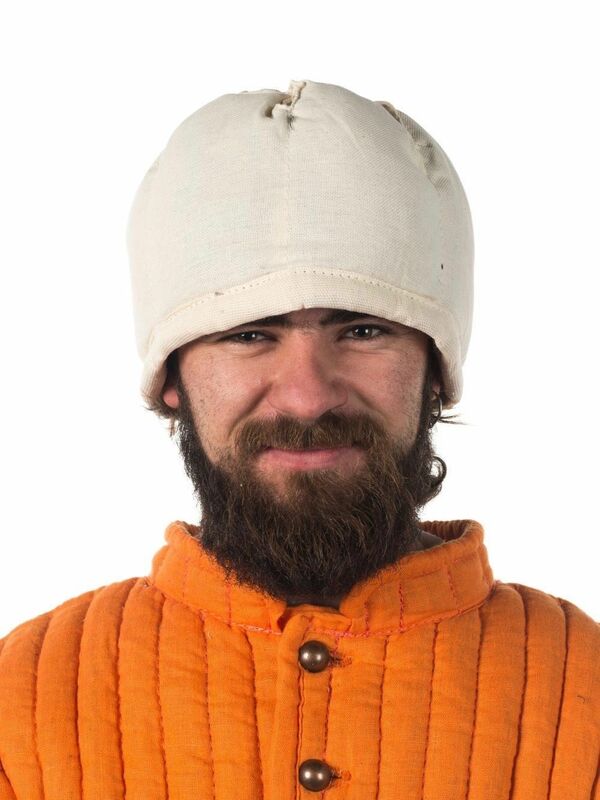 It has drawstring on its top to adjust fitting up to your head size. Liner provides perfect protection during medieval battles and trainings. It's covered with leather, staffed with sheet wadding (natural material) and has inner shell made of 100% natural uncolored cotton .. This liner for "Sugar loaf" Helmet is historically correct reproduced model. It protects top, forehead, sides, back, and chin part. Moreover, it has drawstring to adjust liner thus it would fit both your head and helmet size. Liner is required to be installed to the helmet. It perfectly fits for armet, burgonet and other type of medieval heltmets, where is a necessaty of chin's protection. Standard options are: - staffed with sheet wadding (natural material) - 2 cm thickness - outer shell and liner are made of 100 % natural cotton fabric Different colours are available for order. ..
Pelerine is being fastened to the padded cap with leather string. 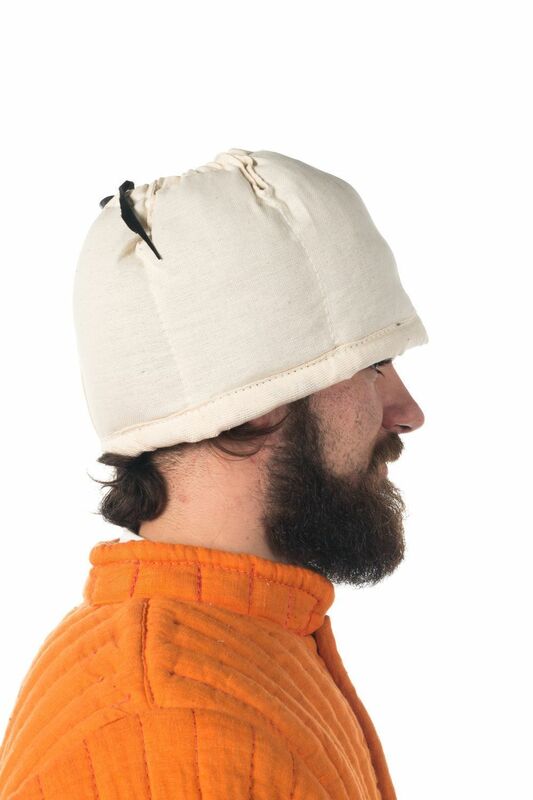 Cap is used as liner for helmet and provides with perfect additional protection during the medieval fencing. 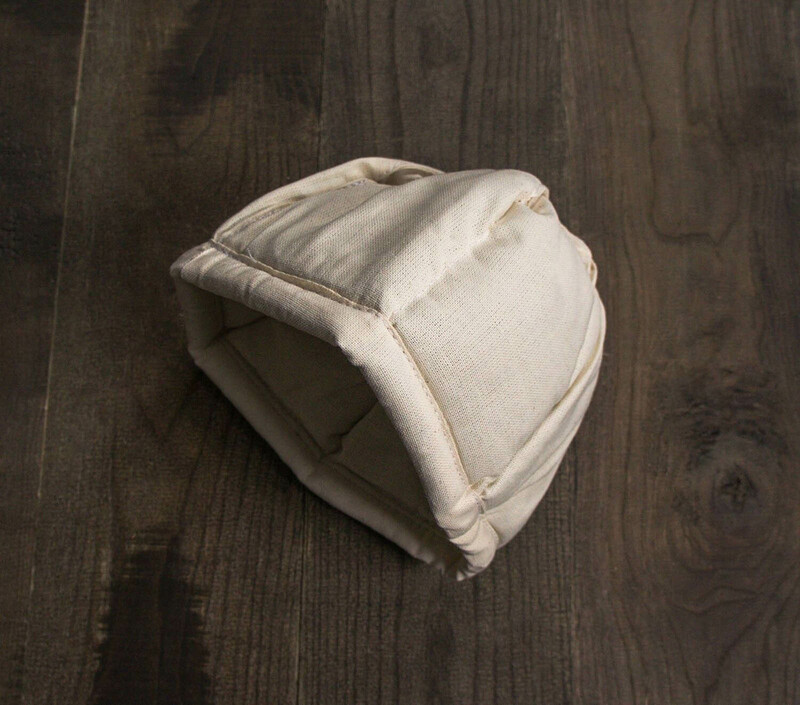 We use only 100% linen and cotton and natural sheet-wadding (50 cotton, 50% wool) for padding. 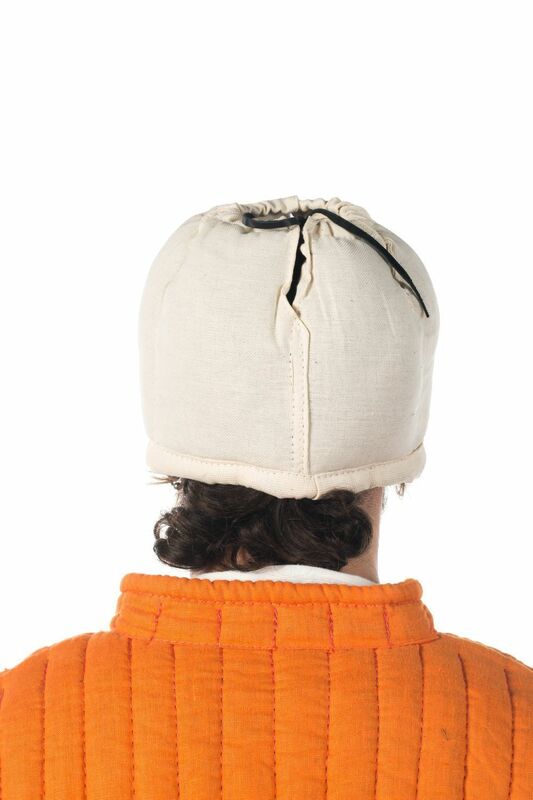 Padded cap with pelerin is a good addition to the gambeson with sewn mittens. Different colours are available for order in options. ..